You don’t jump in a pool if you aren’t sure there’s water in there. You don’t go on a road trip without snacks. And you don’t spend without a budget—if you want to be in control of your money, that is. Before you shop, set up monthly budget. How do you know what to allot for your grocery line? Pull on your inspector hat and do some solid Sherlockian detective work: Look back over last month’s expenses. What did you spend? Start there. Now do a little math. If you budget $400 for the month, and there are four weeks, that gives you around $100 a week to spend. We picked this number because of its simple math-ness, so don’t feel like your total has to line up with our example. And some weeks you’ll overspend or underspend—but it’s about balancing out and staying at, or under, budget by the end of the month. 2. Spend time meal planning—every week. “P-l-a-n-n-i-n-g: Find out what it means to me.” This isn’t one of Aretha Franklin’s lesser-known hits. (Though, admit it, you sang along. Or tried to. Rhythmically, we admit it was flawed.) It’s the second-best piece of advice we have on how to save money grocery shopping. Why does meal planning save you dough? Because intentionality breeds frugality. Just like a budget tells your money what to do, meal plans tell your food what to do. When you know what you’ll be eating, you know what to buy. When you know what to buy, you waste less. It’s a different kind of food chain. Set up a plan for each day of the week, each meal of the day. That doesn’t mean you’re promising everyone gluten-free, blueberry-coconut pancakes for breakfast, but it does mean you’ll have stuff on hand for morning, noon, snacks and night. By the way: If meal planning seems like too much work, look into a service that makes it easy by providing menus and grocery shopping lists—like emeals. Once you pick your preferences, all that’s left is the shopping. And EveryDollar budgeters can try emeals for free for 14 days! Yes, seriously! The next couple tips will help you refine your weekly meal plans. 3. Shop your pantry, fridge and freezer. As you’re plotting what you’ll be preparing, check your kitchen. Are there meatballs in the freezer, noodles in the pantry and salad in the fridge? You’re just sauce and garlic bread away from an easy American-Italian night. Build what you’ll cook on the foundation of what you already have. 4. Consult your social calendar. You’ll also want to think about the week’s upcoming activities. A study on U.S. Grocery Shopper Trends shares that 63% of households think eating meals together as a family is important. (1) But we all know life gets busy. With kids participating in croquet, chess club or choir, some of your nights aren’t conducive to a three-course meal. To beat the drive-thru temptation, know those nights are coming, and plan easy-to-make meals. Even no-kid couples and singles have to deal with active evening itineraries. Look ahead as you plan. 5. Clip and click coupons. Some people are couponing bosses. They know the stores that double or accept both a manufacturer and a store coupon. Other people don’t know what half the words in the previous sentence even mean. And that’s fine! Both of you are awesome, and both of you can save money with coupons. No matter where you’re starting out in the world of couponing, just know they’re a powerful and beautiful tool. Use them! You can clip paper versions, print paper versions from a store’s website, or click digital versions in your favorite store’s app. Let the coupons guide some of your meal planning as well. If you find a coupon for an item on sale–you win! Pass Go. Collect the savings. Even if you aren’t feeling that level of saving and shopping savvy, use the store sales to help you plan—especially the carnivores out there. Meat is expensive. When poultry’s priced right, plan your white chicken chili. When steak’s on sale, fire up the grill. When . . . you get the picture. Take advantage of weekly store ads. And make sure you know the start and end dates of those specials. Some stores restart on Sunday, others on Wednesday. There are few things as saddening to a grocery shopper as missing out on the perfect BOGO. Many off-brand and name-brand products have very few differences. That’s not true for everything, of course. You can be a brand snob—about a few select items. But there are plenty of things you should buy generic. Don’t spend more because you like a label or know a name. Sometimes you like a look and have heard a name just because that company spent more on design and marketing—not because they’re delivering a higher quality product. And never think we’re telling you to buy junk. You can be healthy and thrifty. You just have to be purposeful in your purchasing. It’s time to be firm. With yourself. Are you ready? Practice saying these words in your head: It’s not on my list. Remember that carefully crafted grocery list, guided by store sales and coupons? That list helps you avoid the pitfall of “but it’s on sale!” If it’s not on your perfectly planned list, don’t buy it. If you realize you legitimately forgot something you needed (because we all do! ), that’s fine. But grocery shopping is no time to go off script. 9. Eat before you shop. You’ve heard it before because it’s true: If you shop hungry, your stomach will steer your spending. Suddenly, even bags of pickle-flavored jellybeans look appetizing. We’re friends, right? Well, friends don’t let friends shop hungry. Snack before you shop. 10. Communicate with your spouse or roommates. If you aren’t talking about what you’re buying with the other people in your house, you could easily end up with multiples upon multiples. Of course, you might prefer having separate items for each roommate—but you probably don’t need three gallons of milk in a two-parent, two-kid household. Probably. Plus, if you’re planning to make enough beef bourguignon and chocolate soufflé for everyone, you’re going to want everyone to know. That way you aren’t interrupted and irritated by a pizza delivery scheduled by a well-meaning, yet uninformed, family member or friend. 11. Carve out the appropriate amount of time to shop. Never shop when you don’t have time to shop. That seems nonsensical, but we all do it. Adulting is hectic. We squeeze every to-do item in between another to-do item. Grocery shopping can be the same. But if you don’t go in with a list and a plan—with the appropriate amount of time to get everything on that list—you’re setting yourself up for failure. And not only do you need enough time to shop, you need the right time of day as well. Nothing says flustered-therefore-forgetful like a bustling grocery store. If you’re able, shop at non-peak times. You don’t want to have to stick your hand through a crowd and grab whatever bottle of salad dressing you can. That’s how you end up at home with overpriced, limited-edition, nacho-cheese-flavored ranch. A clear mind and clear aisle mean the ability to compare prices and brands. 12. Always track your expenses. Last but not least, track those expenses! After you load up the car, pause momentarily before pulling out of the parking lot and enter that total in your EveryDollar grocery budget line! Oh, and don’t forget to split those transactions—otherwise your makeup remover or beard oil will spill into and wipe out your grocery budget. Tracking what you spend is the only way to know what’s left to spend! Knowing what’s left, and not going over, is how you call the shots with your money! We’ve got a lot more tips and tricks in our Complete Guide to Grocery Savings. Check it out if you’re into free advice that could save you tons of cash. 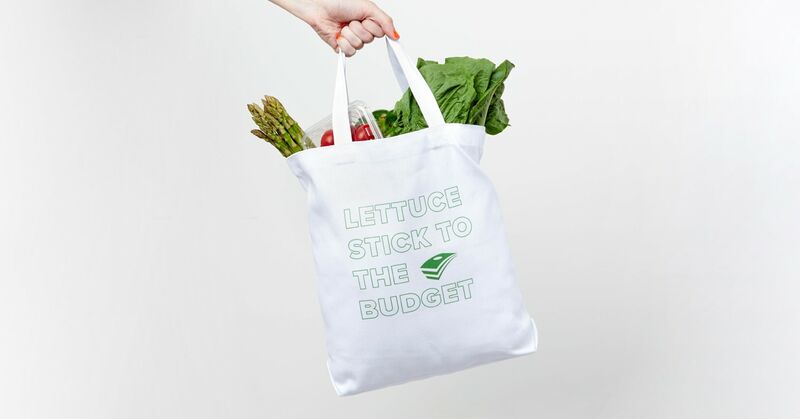 And remember our number one step in saving on groceries? Budget first. So . . . start now! Set up your grocery budget in EveryDollar right now, and get ready to save, save, save.